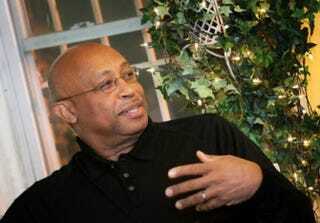 Michel du Cille meets with a dinner group of Washington journalists of color in October. He spoke of his enthusiasm for covering the Ebola story in Liberia. "Michel du Cille, a Washington Post photojournalist who was a three-time winner of the Pulitzer Prize for his dramatic images of human struggle and triumph, and who recently chronicled the plight of Ebola patients and the people who cared for them, died Thursday while on assignment for The Post in Liberia," Matt Schudel reported for the Washington Post. "He was 58. "He collapsed while returning on foot from a village in the Salala district of Liberia's Bong County while working on a project. He was transported over dirt roads to a hospital two hours away but was declared dead on arrival of an apparent heart attack. "Mr. du Cille won two Pulitzer Prizes for photography with the Miami Herald in the 1980s and joined The Post in 1988. In 2008, he shared his third Pulitzer, with Post reporters Dana Priest and Anne Hull, for their investigative series on the treatment of military veterans at Walter Reed Army Medical Center. . . ."
Du Cille was the only African American to have won three Pulitzer Prizes, Mike Pride, administrator of the prizes, confirmed on Friday. Playwright August Wilson and biographer David Levering Lewis have each won two. Du Cille's wife, Post photographer Nikki Kahn, is also a Pulitzer winner, awarded in 2011 with her Post colleagues Carol Guzy and Ricky Carioti "for their up-close portrait of grief and desperation after a catastrophic earthquake struck Haiti." Post story continued. "He was renowned among journalists for his ability to look inside a crisis and find enduring portraits of sorrow, dignity and perseverance." Donald R. Winslow, a photography classmate of du Cille’s at Indiana University, wrote Thursday for the National Press Photographers Association, "Many of du Cille's close friends were well aware of the fact that within the past few years he valiantly battled and defeated multiple myeloma bone cancer, enduring chemotherapy and treatments as the cancer went into remission. More recently du Cille had knee replacement surgery. The work in Liberia was strenuous and much of it on foot, and this was his second rotation into Liberia this autumn to cover the outbreak. "Du Cille had spoken by phone within the past week to his friend Kenny Irby at The Poynter Center, discussing Du Cille doing a master class for the center. Irby is a Poynter senior faculty member and director of community relations, as well as being a minister and du Cille's longtime friend. Irby told du Cille that he thought he sounded tired. "Du Cille, who [was] still on the mend from his knee replacement, assured Irby that he was fine and just needed some of his friend's solid spiritual encouragement. He asked Irby to pray for him and for his wife, Post photographer Nikki Kahn. At the end of the conversation, Irby said, du Cille's last words to him were, 'Kenny, you have buoyed me.' . . ."
In two recent appearances before black journalists, du Cille spoke about his love for Africa and said that were it up to him, he would stay there far longer than his employers would allow. If he did not cover the crisis, people would not know how bad it was, he said. Most recently, du Cille appeared via Skype before the Trotter Group of African American columnists, who met in Jackson, Miss., last month, and in October before the Journalists Roundtable, a dinner group of Washington journalists of color. The October meeting took place just after du Cille was barred from participating in workshops with Syracuse University journalism students because he had been working in Liberia the previous month. Administrators said some on campus feared they might catch the Ebola virus, even though du Cille had passed the 21-day watch period for symptoms. Du Cille said then that did not want to discuss the dispute with Syracuse publicly any longer, but he did speak of his passion for documenting the Ebola crisis. He wrote for the Post, "I believe that the world must see how horrible and dehumanizing are the effects of Ebola." He told Journal-isms on Oct. 13 by email, "After eight trips to the African continent, I never tire or complain about the harshness of life. To me each journey there is an almost spiritual experience. I guess partly because I relate so well to the West African way. Growing up in Jamaica was very much the same; the cadence, body language of the people are very similar. Fellow dinner guest Teri Agins, a fashion columnist for the Wall Street Journal, wrote on social media then, "Michel's talk was spellbinding….so brave and compassionate…praying for his safe and healthy travels as he continues to document the Ebola scourge…and beyond! Talk about shoe-leather reporting!!!" In 2002, du Cille was a picture editor in an ambitious multimedia project, "A Day in the Life of Africa," when 100 of the world's top photographers fanned out across the continent for a 24-hour shoot. Asked by Journal-isms then what distinguished these photographs from others by Westerners, he replied that in these images the Africans were smiling. Winslow wrote for NPPA, "His photographs, early in black-and-white then later in color, were distinctive, clear, iconic, uncluttered and concise. As an editor or a photographer or during his stint as the Post's photography director, he knew how to pick his own work and the best work of his peers - and he knew how to fight for it to be used properly in print. . . ."
The Post said in its obituary that du Cille "became known not just for his unerring eye through the lens but also for his keen ability to observe talent. "He recruited many of the paper's photojournalists and oversaw The Post’s photographic coverage of the 2010 Haitian earthquake, which won a Pulitzer Prize. "He helped advance the paper's photography into the digital age, with the developing of online galleries and other ways of displaying visual content on the Web. He was instrumental in shooting and producing The Post's monumental 2006 series, 'Being a Black Man' and became a mentor for African American and other minority photographers throughout the country. . . ."
On Friday, longtime Post Executive Editor Leonard Downie Jr. sent this note to the newsroom: "Michel always told me that he was not 'just a photographer' — as peerless a technical photographer as he was. He wanted to be known as a 'photojournalist' who reported and told stories just as the best print reporters did. "The Washington Post had some notably good photographers doing notably good work before Joe Elbert and Michel Du Cille came from the Miami Herald to run our photography department. But they revolutionized photojournalism at the newspaper and, later, on the web. Michel was a multiple-Pulitzer example for Post photojournalists and a demanding but empathetic mentor as both an editor and shooter. "The wealth of white households was 13 times the median wealth of black households in 2013, compared with eight times the wealth in 2010, according to a new Pew Research Center analysis of data from the Federal Reserve's Survey of Consumer Finances," the Pew Research Center said on Friday in a news release summarizing its findings. "Likewise, the wealth of white households is now more than 10 times the wealth of Hispanic households, compared with nine times the wealth in 2010. "The current gap between blacks and whites has reached its highest point since 1989, when whites had 17 times the wealth of black households. The current white-to-Hispanic wealth ratio has reached a level not seen since 2001. "The Pew Research Center analysis reveals a stark divide in the experiences of white, black and Hispanic households during the economic recovery. From 2010 to 2013, the median wealth of non-Hispanic white households increased from $138,600 to $141,900, or by 2.4%. "Meanwhile, the median wealth of non-Hispanic black households fell 33.7%, from $16,600 in 2010 to $11,000 in 2013. Among Hispanics, median wealth decreased by 14.3%, from $16,000 to $13,700. For all families — white, black and Hispanic — median wealth is still less than its pre-recession level. . . ."
"The judges said: 'If ever a newspaper and its editor faced a real-time stress test, it was the St. Louis Post-Dispatch and editor Gilbert Bailon in 2014. From the shooting of Michael Brown in August through the November announcement by the grand jury, the Post-Dispatch was under pressure. But it delivered for its readers and the larger St. Louis community with a breadth of coverage that is truly impressive. Hundreds of stories, dozens of editorials, every piece of evidence — all were there either in print or on the paper's website. Most striking were the photographs, often taken at great personal risk to the photographers. Throughout it all, Bailon was a strong presence both in the community and in his newsroom, fighting for access and striving to keep the coverage balanced and emotions in check." Veterans of the Student Nonviolent Coordinating Committee, which 50 years ago organized black Mississippians to defy segregationists and register to vote during the landmark "Freedom Summer," indicated this week that the news media should be paying more attention to what is being done to organize communities such as Ferguson, Mo. "There is a piece of the protest story that many journalists seem to be missing," Charles E. Cobb Jr., a journalist and one of the SNCC veterans, told Journal-isms Friday by email. "The need to organize is slowly emerging and some of the young activists are reaching out to older civil rights movement veterans seek their opinion." The veterans reconstituted as the SNCC Legacy Project in 2011 with Courtland Cox as president and Julian Bond vice president. They said in a statement, "Cops killing young black men is hardly a new story. Nor is the white supremacist assault on black and brown communities anything new. Individuals and organizations have fought both for centuries, and continue to do so today; so ours is neither the first nor the only voice to be raised urging that struggle continue. It does appear to us, however, that a new movement is emerging and spreading across the nation, and that young people in particular have taken the lead in fighting police thuggery. We applaud and support this and stand in solidarity with them. . . ."
Their statement also said, "We were born in protest against now-outlawed racial segregation, but quickly learned that protest, while necessary, was not sufficient for tackling the larger issues we soon encountered. Therefore, we became an organization of organizers. "Understanding our evolution is crucial for understanding the relevance of then to now. As we thought about what was to be done to really effect change, the conclusion we came to was to organize for political power, challenge and confront police brutality, and to probe the possibilities of economic development in disenfranchised communities. This required that we embed ourselves in those communities, listening and learning how best to assist local people find their voices, and to organize for the change they wanted. This was neither dramatic nor speedy and was largely ignored by the media. And obviously, not everything that needed to be accomplished was accomplished given the issues we face today. . . ."
The group also said, "In Ferguson, which is two-thirds black, a total regime change is possible with effective organization. And that is a conversation we hope community leaders are already having in light of the fact that in the last municipal elections only six percent of eligible black voters came out to vote. In this particular case, we believe that every elected official now in office can and should be turned out of office when the next municipal election is held. In other cities, counties, and states the numbers exist to dramatically affect government, even where black and brown voters are not a majority of the population. "In any case, an organized black community is an empowered black community. And this need not be a solely black effort. There is a great need to encourage the involvement of the total community and its religious, educational and existing community organizations. As we learned in the South, bad government for black people almost always means bad government for white people, too, especially poor whites. So coalitions with like-minded people are essential in our view. . . ."
The complete statement is in the "Comments" section. C-SPAN plans coverage starting at noon Saturday of the "Justice For All" march and rally in Washington, with the Rev. Al Sharpton and family members of Eric Garner, Michael Brown and Tamir Rice, all African Americans killed by police. Avis Thomas-Lester, Washington Informer: SNCC and the Rise of Marion S. Barry Jr.
"U.S. Attorney General Eric Holder won't compel The New York Times' James Risen, a Pulitzer Prize-winning journalist, to name his confidential source on CIA operations intended to prevent Iran from building its nuclear program," Camila Domonoske reported Friday for NPR. "After that, 'federal officials called for investigations, and Risen received his first of three subpoenas to compel him to disclose his source." "Risen, who shared a Pulitzer Prize for revealing the scope of the NSA's [warrantless] wiretapping program in 2005, refused, and risked jail as a result. . . ."
"Earlier this week when Andy Carvin unveiled reported.ly, not only did we get a glimpse at the innovative way First Look plans to cover news, but we also saw a highly diverse news team," Tracie Powell reported Thursday for alldigitocracy.org.
" 'As a global news project, we wanted to start with a team that was both geographically and linguistically diverse,' said Carvin who announced the breaking news venture on Monday. 'So we have team members who speak Italian, Greek, French, Vietnamese, Irish and Spanish, for example. We're also exploring bringing on freelancers who can help us with languages like Arabic, Russian, Mandarin, etc. "Not only did First Look receive blistering criticism for its lack of diversity when it launched in February, but the company has undergone a series of setbacks in recent weeks with the well-publicized implosion of Racket, a digital media magazine that was shut down before it ever got off the ground. The increase in diversity at the startup, backed by billionaire eBay founder Pierre [Omidyar], is welcome news, and it's not just limited to reported.ly. . . ."
"Journalists threatened by the paramilitary group 'Bloque Capital — Águilas Negras' were holding a meeting in Bogotá today to publicize the dangers they face," Reporters Without Borders reported on Thursday. "The group has given news outlets a deadline of 1 January to leave the cities where they operate, but the government has yet to respond. Reporters Without Borders is concerned about the dangers to freedom of information and pluralism in Colombia. "Águilas Negras issued three blacklists in less than four days in early December, a clear sign that it wants to silence journalists that they find troublesome. It describes the targets as 'terrorists directed by FARC (Revolutionary Armed Forces of Colombia) and the ELN (National Liberation Army)' whom the group vowed to 'silence with lead'. "They comprise 14 journalists and 12 media organizations, most of them community-based or alternative outlets that cover the peace talks or investigate human rights abuses, organized crime and corruption. "The allegations by Águilas Negras bear a disturbing resemblance to those made by the former president, Senator Alvaro Uribe, during a debate in September this year in which he accused the public television station Canal Capital of being 'an accomplice of terrorism'. . . "
Miss Nebraska 2015 Works as a "Video Journalist"
"Hoang-Kim Cung, better known to NBC Nebraska viewers as Kim Cung, has been crowned Miss Nebraska USA 2015," KSNB-TV in West Hastings, Neb., told viewers. Cung works at the station as a "video journalist." "She will go on to compete in the 2015 Miss USA Pageant," KSNB-TV continued in its Nov. 29 broadcast. The station's bio says, "The only member of her family to be born in America, Kim is extremely grateful for the sacrifices her family made when immigrating from Communist Vietnam. . . ."
Journalists Advised to "Become Part of Their Community"
"In September, KRIV Houston reporter/commentator Isiah Carey broke big national news — a Houston-area grand jury's indictment of Minnesota Viking Adrian Peterson on child abuse charges — thanks to the years he spent courting suburban sources few reporters bother with," Diana Marszalek wrote Tuesday for TVNewsCheck. "Carey, who didn't even know who Peterson was at the time, did it while home sick from work. "His driveway confrontation of another shamed football player this year — the Houston Texans' Arian Foster, a married man who got a college co-ed pregnant — went viral. "Yet perhaps the story that best epitomizes the ethic that drives much of Carey's work is the one he walked away from, despite its scandalous appeal. "It was two, maybe three, years ago, when Carey got a call from a parent, claiming that a local elementary school teacher, the kind of woman who's named Teacher of the Year again and again, was actually a man. . . ."
Marszalek also wrote, "Carey believes TV news — as well as the viewers it serves — would greatly benefit if reporters cultivated deeper relationships with the people they cover. 'If they would come out of their homes — not just cover the news and go home and call it a day — we would have more compassionate coverage,' he says. 'It doesn't take a black reporter to cover black people if people would become part of their community.' . . ."
Anchor Andrés Herrera, who works for the Telemundo affiliate in Bakersfield, Calif., "was attacked by a man outside the KGET studios just as he was about to enter the station earlier today," Veronica Villafañe reported Wednesday for her Media Moves site. "Andrés was taken to the hospital, but wasn't seriously injured. The assault was captured by a security camera. Andrés says that when the man approached him he asked in a friendly tone if he worked there. 'I said yes and he proceeded to take a long swing at my face with a massive punch and walked away. . . ."
"A Los Angeles television reporter has been charged with felony domestic violence after he allegedly seriously injured his wife by throwing a flower pot at her head, authorities said," Marisa Gerber reported Wednesday for the Los Angeles Times. "The pot struck the woman 'full force,' an L.A. County district attorney's spokesman told the Los Angeles Times. Carlos Zapata, a reporter with Spanish-language station KWHY-TV Channel 22 who sometimes covers crime, could face 10 years in state prison. He's charged with two counts of injuring a spouse. . . ."
" 'Fusion Live,' the nightly newscast of the 14-month-old ABC-Univision network has been canceled, TVNewser has learned," Chris Ariens reported Friday for TVNewser. "This is the second cancellation this week of a nightly newscast geared toward millennial viewers. On Monday, Pivot shelved 'Take Part Live.' 'Fusion Live' had been a part of the network's primetime since March. Anchored by Mariana Atencio, Pedro Andrade and Yannis Pappas, who had been the hosts of 'The Morning Show,' 'Fusion Live' aired at 8pmET. Pappas left the network in August. Atencio and Andrade will turn their attention to specials produced by a new production team headed by VP of news Mark Lima. . . ."
"Telemundo and MSNBC anchor José Díaz-Balart is having a big week," Brian Flood reported Wednesday for TVNewser. "Yesterday, he interviewed President Obama and today, on the House floor, he was congratulated for his 30 years in journalism. 'José has proven to be a valuable voice to the Hispanic American community,' said Rep. Ileana Ros-Lehtinen (R-FL), who represents South Florida. We're guessing José's. . . brother, Rep. Mario Díaz-Balart, who represents another Florida Congressional district, gave his congratulations in person. 'There are hundreds of journalists in Cuba and around the world who are being persecuted and imprisoned for showcasing the realities within their own countries. José speaks for them,' Ros-Lehtinen added. . . ."